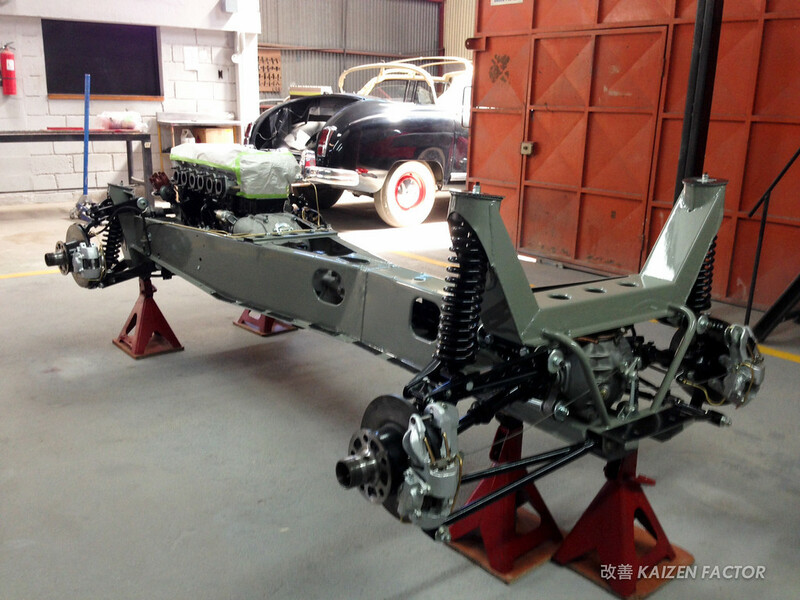 The Ultimate Toyota Restoration begins with removing all the parts from the MF10’s body including the 3M 2.0L Inline 6 & 5M 5 Speed Manual Transmission. The MF10’s aluminum body is carefully repaired to remove all blemishes and imperfections from every panel. No plastic fillers are used. 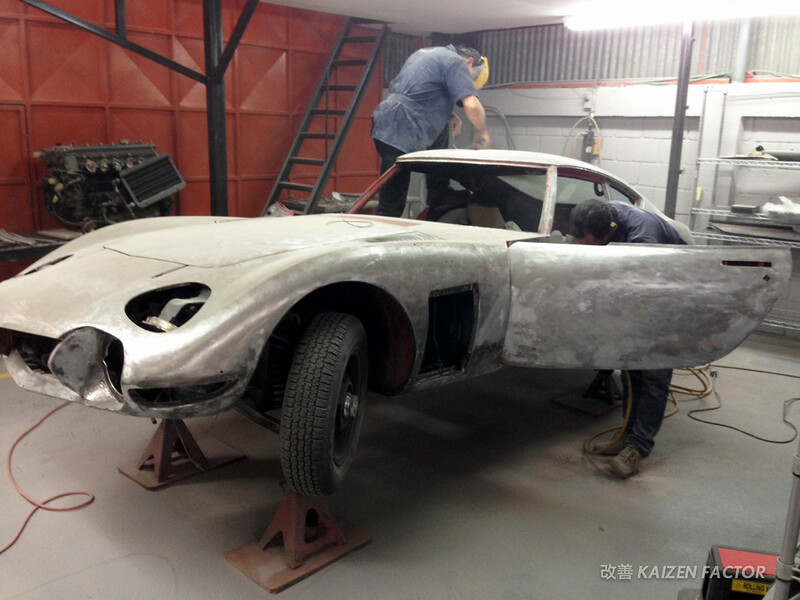 To ensure a flawless finish throughout, the whole body is stripped of paint down to the bare aluminum surface. 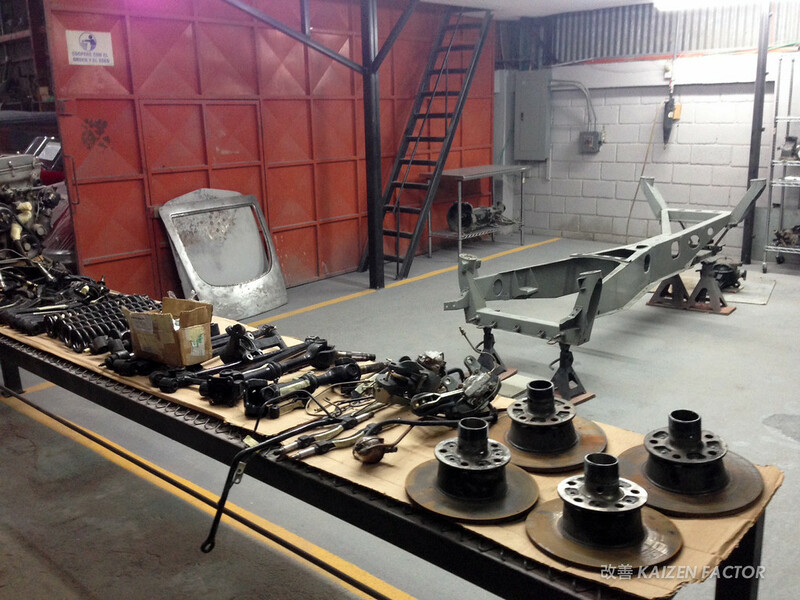 Every wheel well is stripped of undercoating and the bare aluminum is repaired for any surface blemishes. 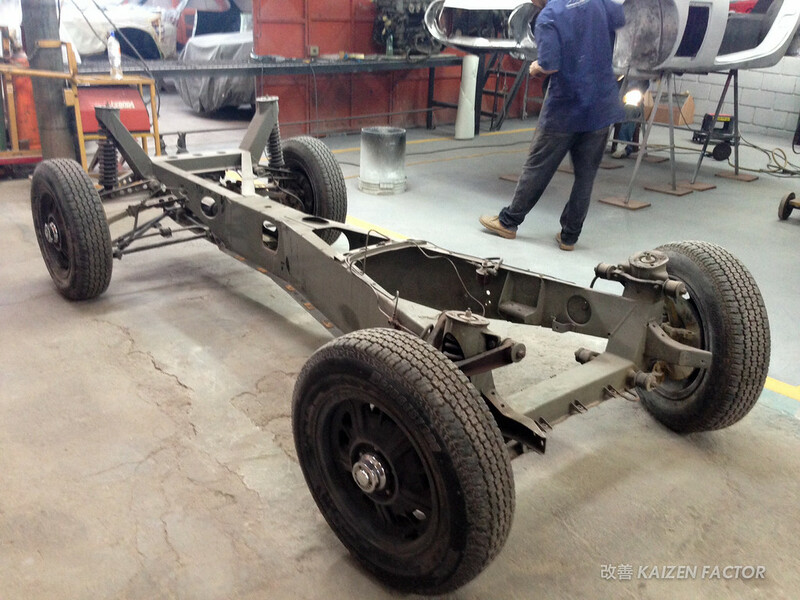 Next the bare aluminum body is removed to expose the x-shaped backbone type steel chassis. 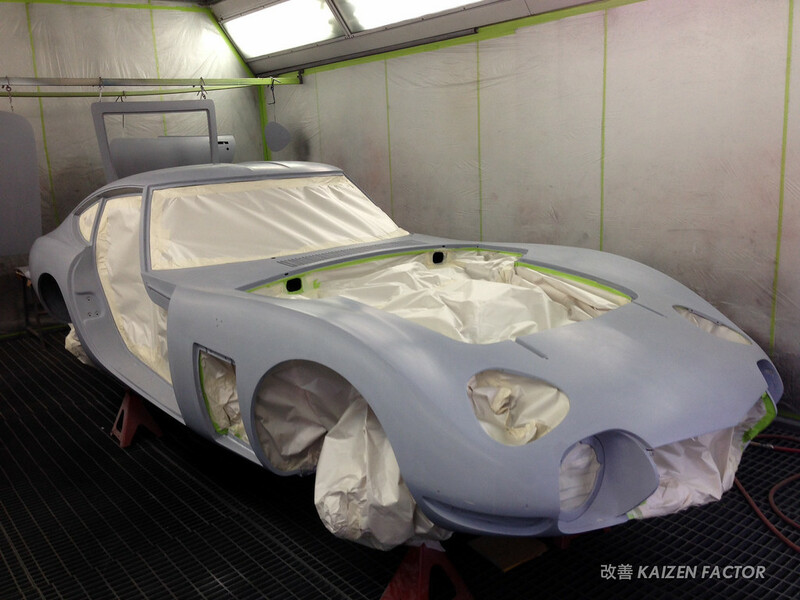 The exterior panels are prepped with the first coat of primer. 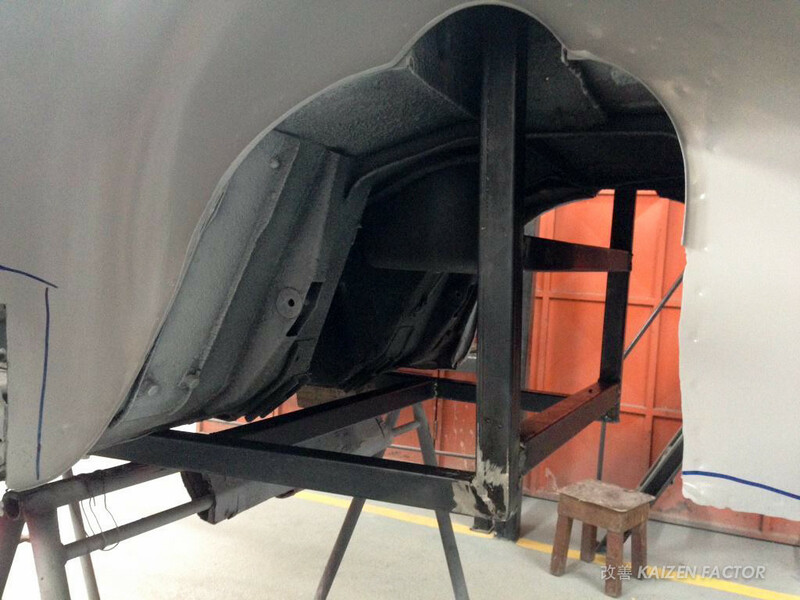 The MF10’s underbody is prepped with an anti-chip undercoating and also primed for paint. 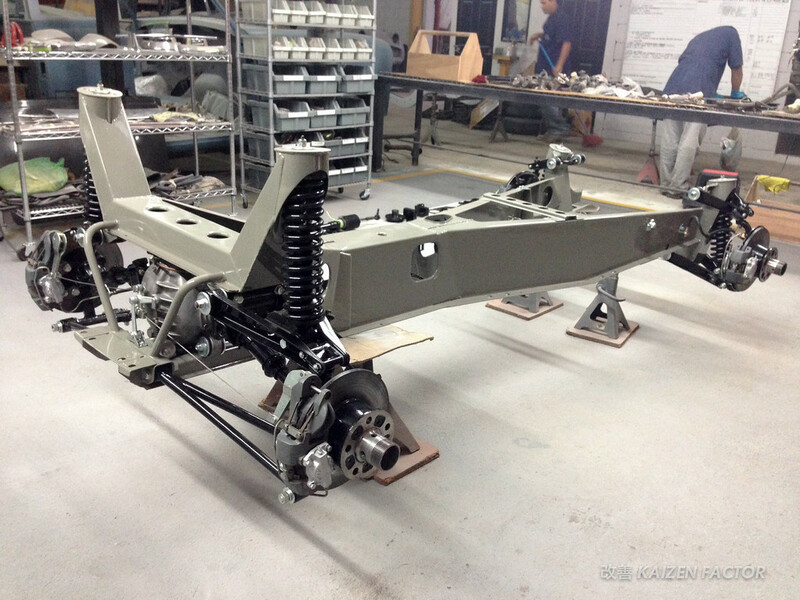 The double wishbone suspension, rack and pinion steering and other chassis components are removed from the x-shaped chassis. 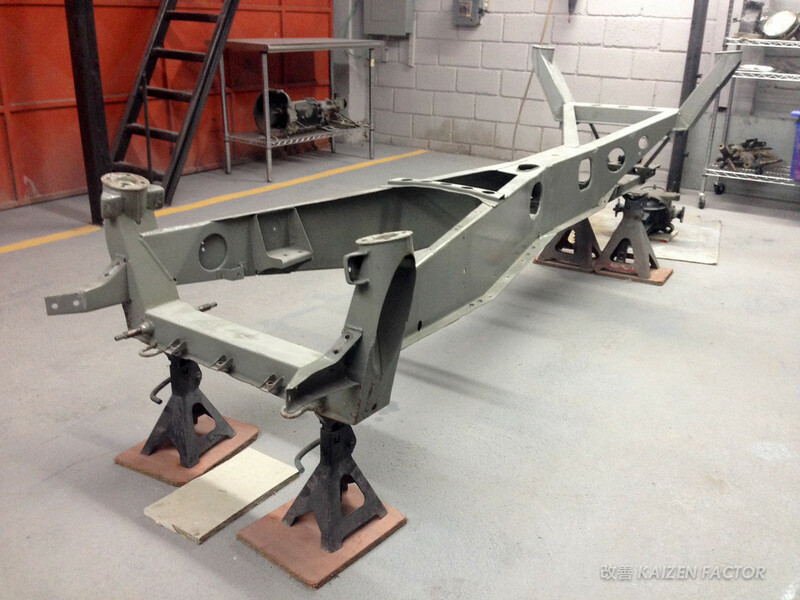 Once stripped, the x-shaped chassis is also stripped of paint and refinished with the original light gray finish. 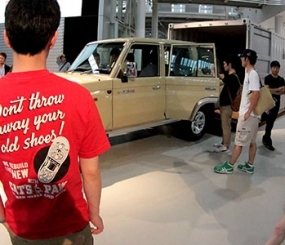 This is to prevent corrosion and to maintain an original appearance. 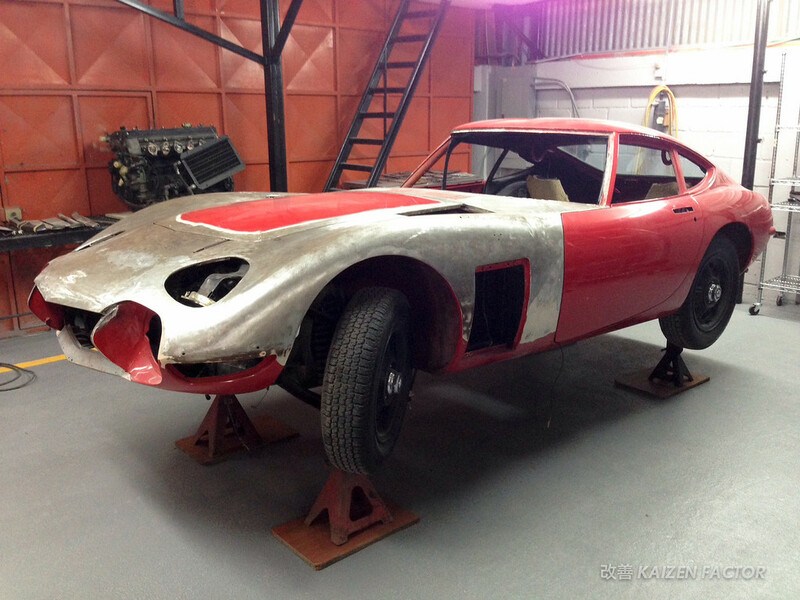 What sets this 2000GT restoration apart from the rest, the suspension and chassis components are replaced with brand new, original factory Toyota 2000GT parts down to each hose, clamp, nut and bolt. 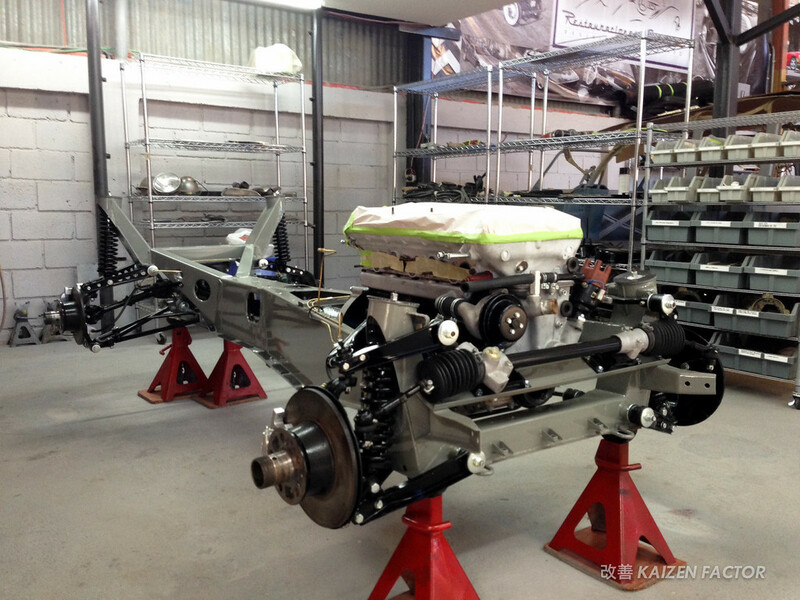 The MF10’s 2M 2.0L Inline 6 is completely rebuilt and refurbished with exact Toyota genuine parts and is mated back to the x-shaped chassis. 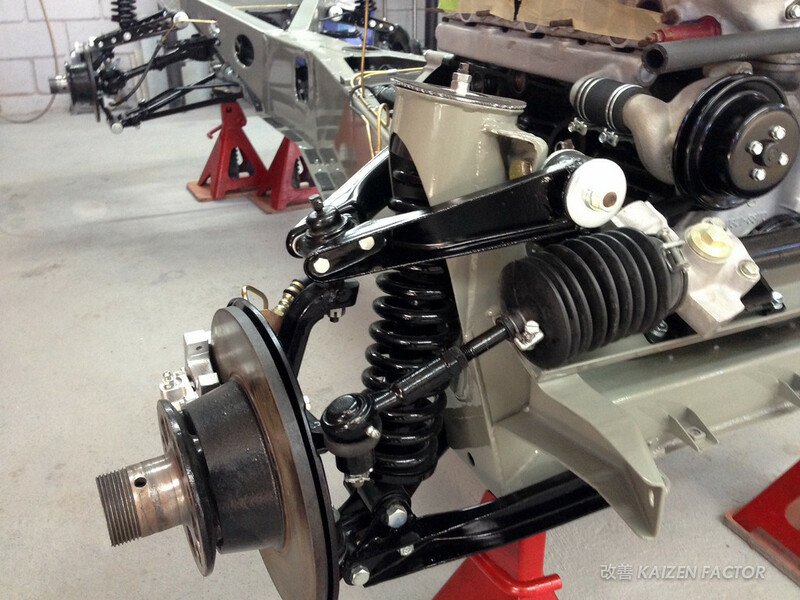 Here’s a close up of the brand new double wishbone suspension and rack and pinion steering. You can also see all the new cooling hoses, water pump and brake components. 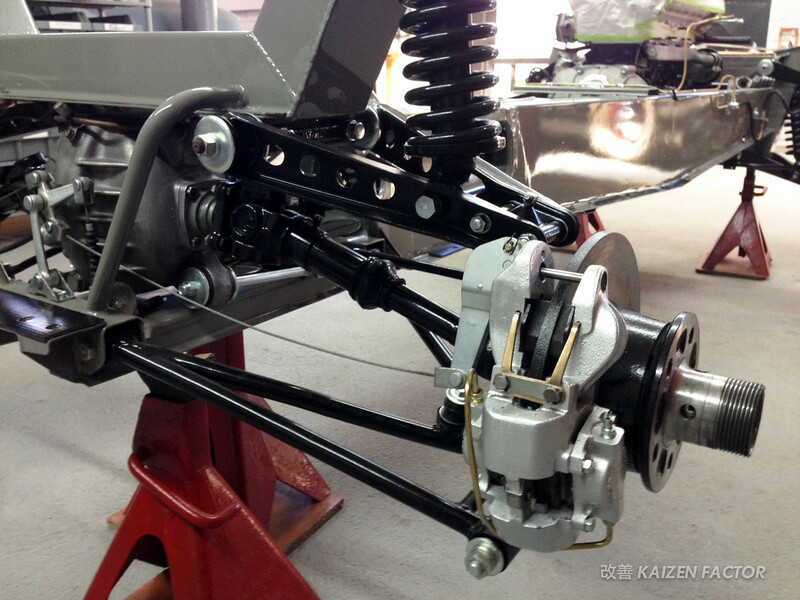 A closer look of the MF10’s rear end including the rear suspension. The brake pads, calipers, rotors, hubs are all brand new. A wide view of the complete x-shaped chassis from the rear. 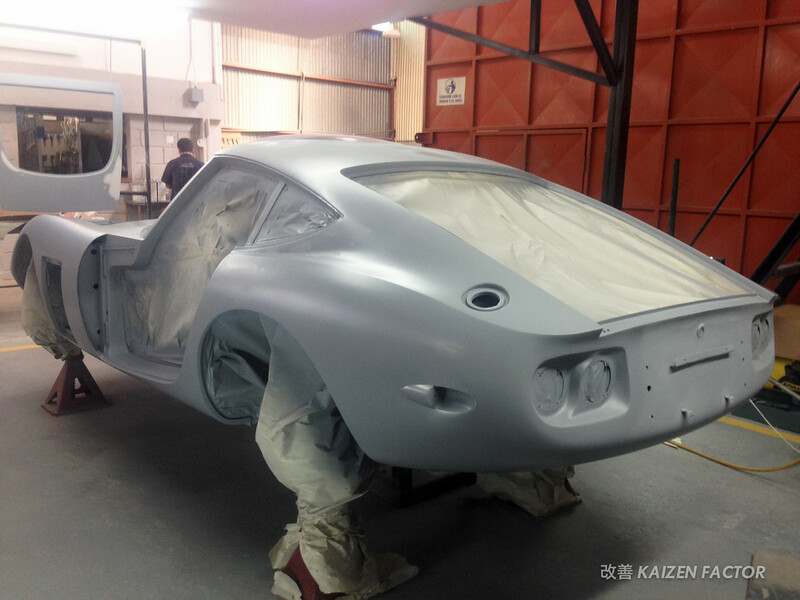 The aluminum body is now completely covered in primer from top to bottom, inside and out. 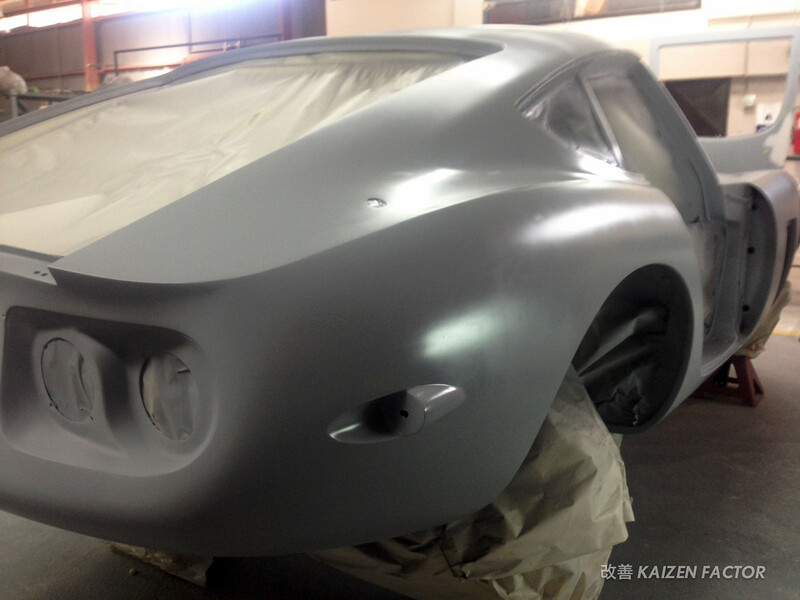 A rearward view of the completely primed body of MF10-10128. Close up, you can see the MF10’s aluminum body is free of any surface imperfections and blemishes. 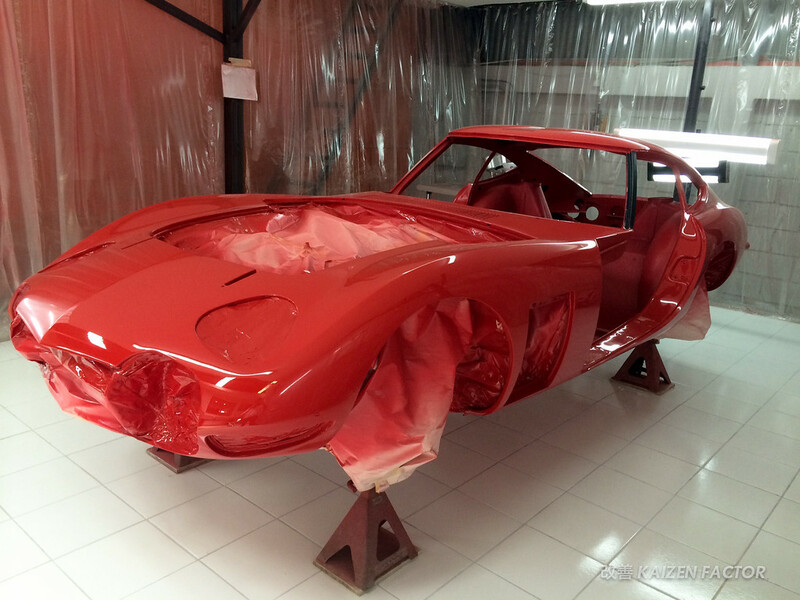 This primer coat ensures that the final coat of Solar Red (2310) will go on flawlessly and ensure a finish of a lifetime. The primer is sanded down and the excess dust is cleaned off. 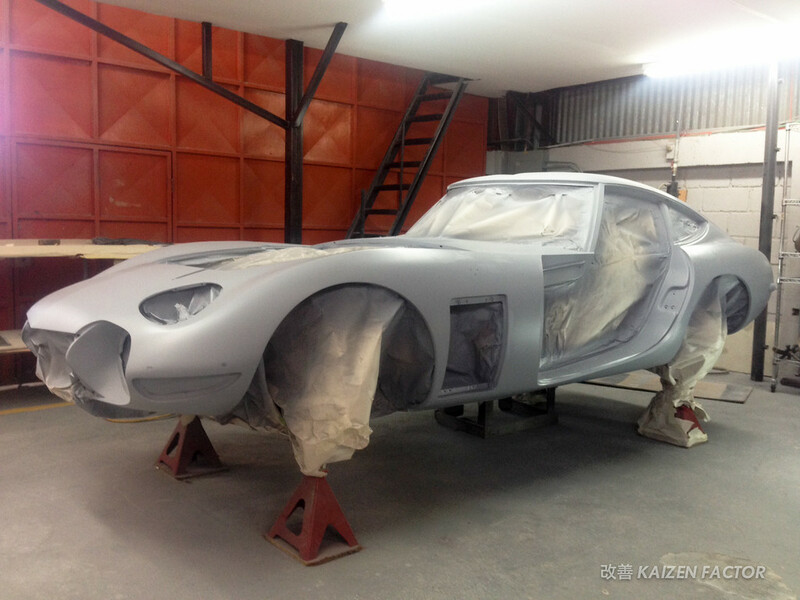 Now the body is sent into the paint booth and prepped for paint. 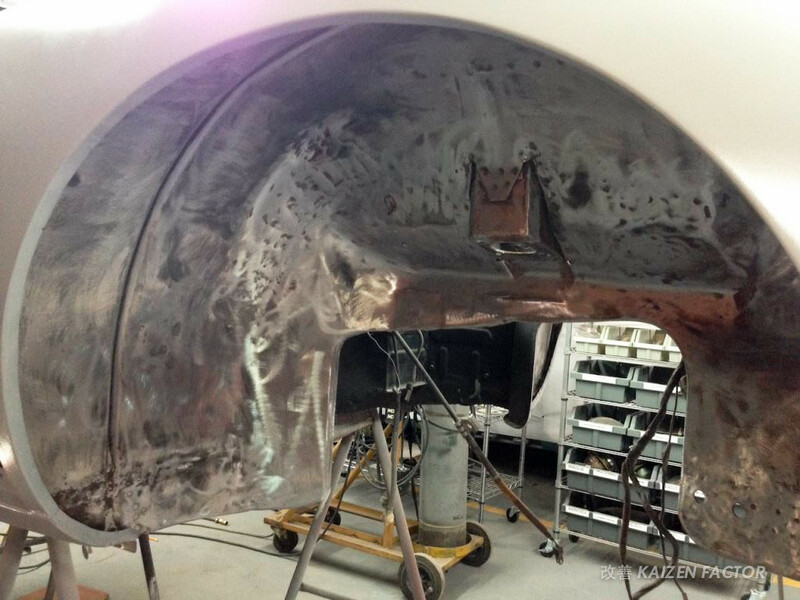 All the openings and jambs are completely masked off to avoid overspray. 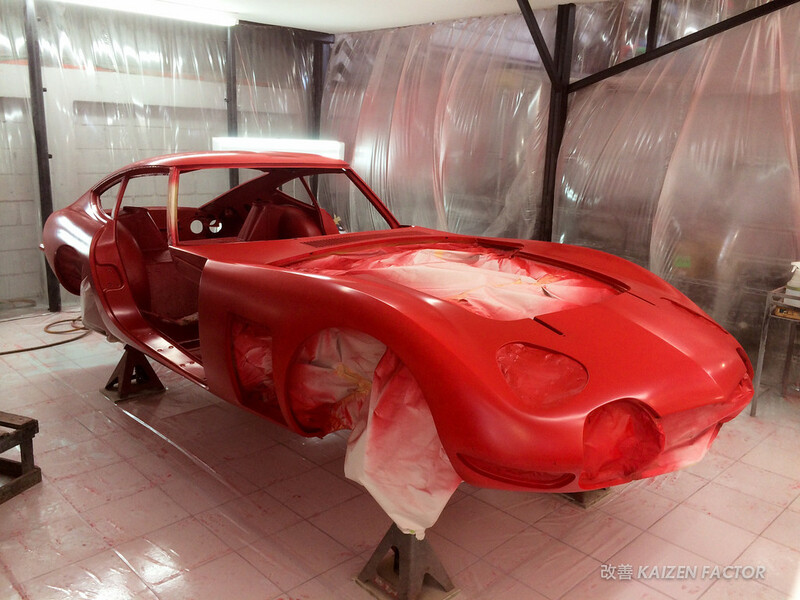 The 2000GT is now ready for its original Solar Red (2310) paint job. 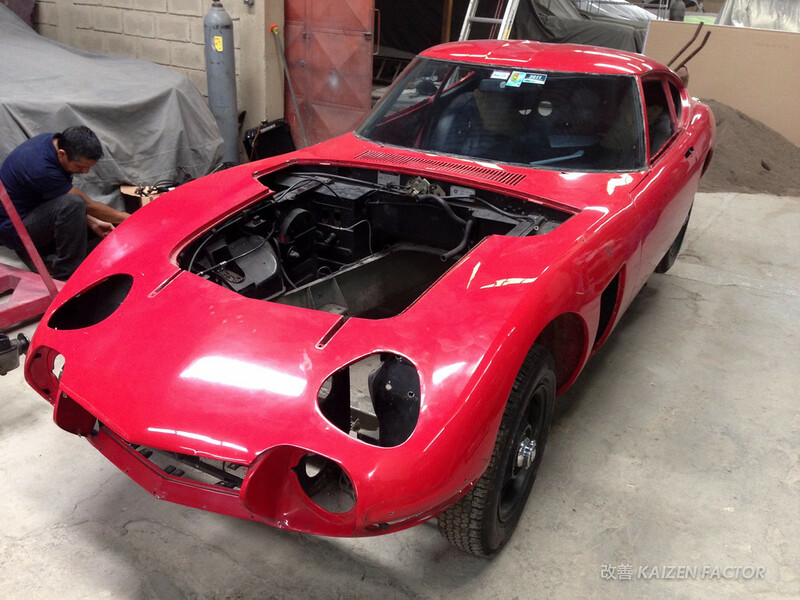 Once the paint has had time to dry, all the painted Solar Red surfaces are color sanded and buffed to remove small nibs and any hint of orange peeling on the painted surface. Another look at the depth and luster of the fresh Solar Red paint on the MF10’s body. 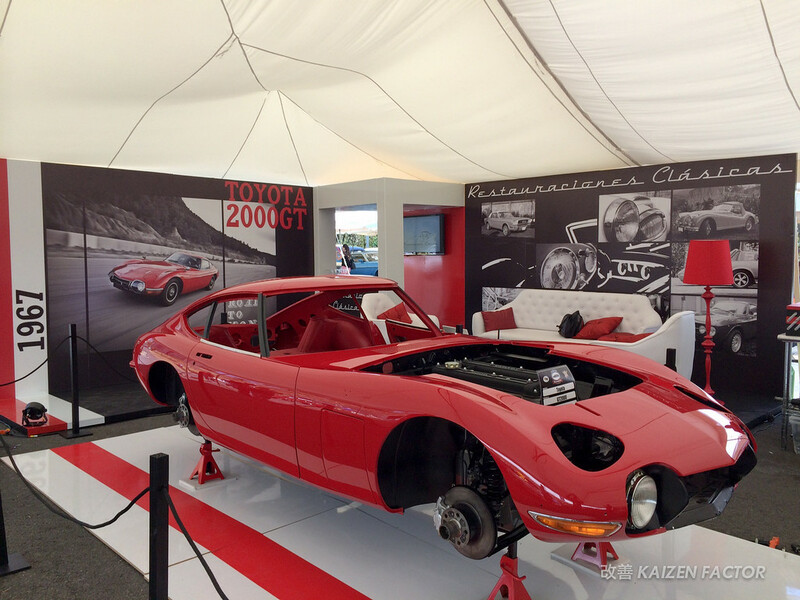 Here is the finished painted chassis on display in Costa Rica. 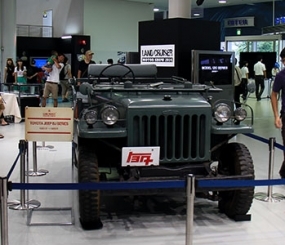 The complete restoration of MF10-10128 was completed by Diego Rodríguez of Restoracion Clássicas. 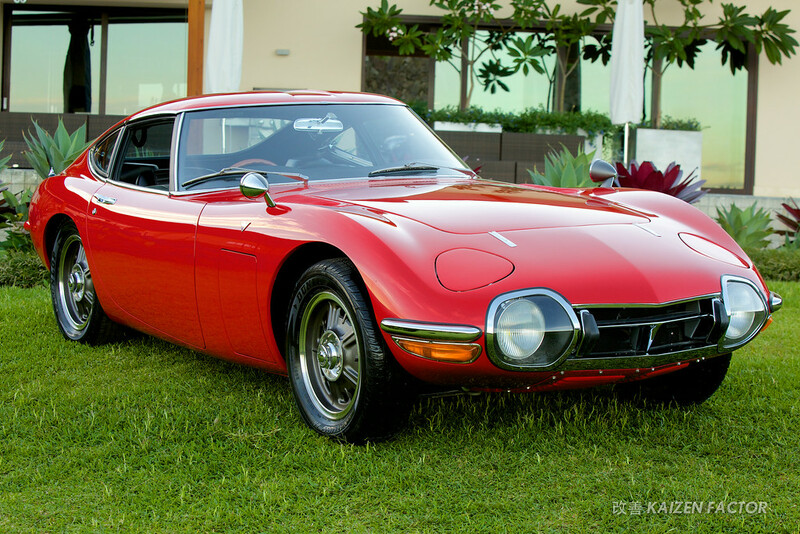 The Most Valuable Toyota 2000GT Ever Restored? 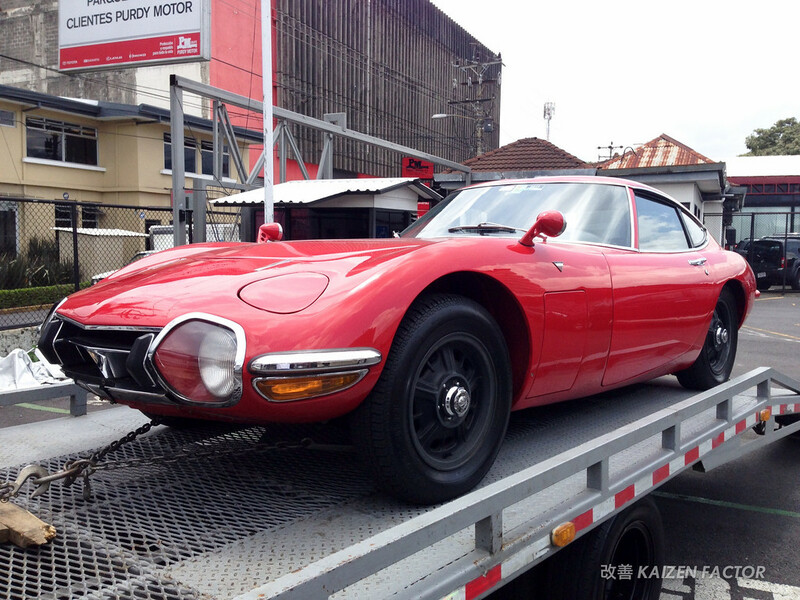 The Toyota 2000GT has been a historic Japanese classic car icon, especially after a modified open top version appeared in James Bond’s “You Only Live Twice” spy flick. 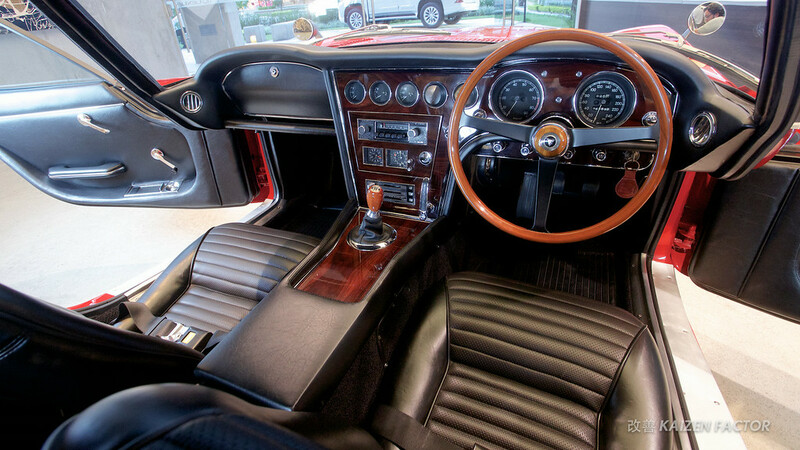 Overshadowed by its European counterparts, the 2000GT has flown under the radar for decades. Not until last year, a Bellatrix Yellow 2000GT (MF10-10147), surpassed the $1M mark for the first time selling at nearly $1.2M at the RM Auctions, Don Davis Collection in Texas. For MF10-10128, it will be auctioned off this weekend at the RM Auction in Monterey. 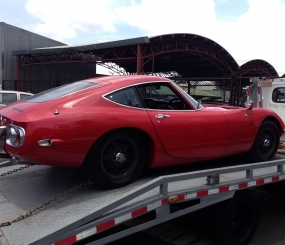 It’s expected to sell between $700,000-$900,000, but with the complete chassis being miticulously refreshed and every single part returned to factory-spec, I expect Mr. Quiros personal Toyota 2000GT to be the most valuable 2000GT on the market. 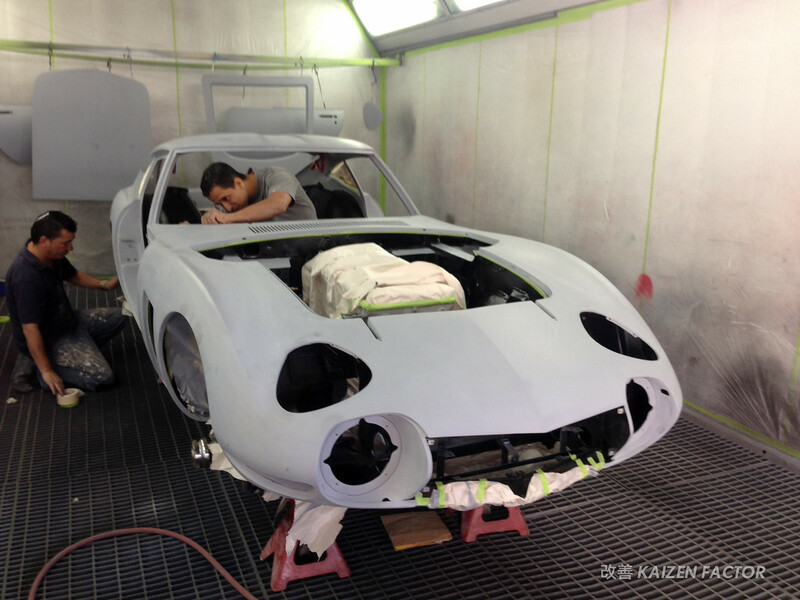 Because this is not your ordinary classic car restoration, he personally commissioned Restoracion Clássicas to bring back his 2000GT in the condition as it left the factory on October 19, 1967 at the Iwata, Shizuoka plant in Japan. 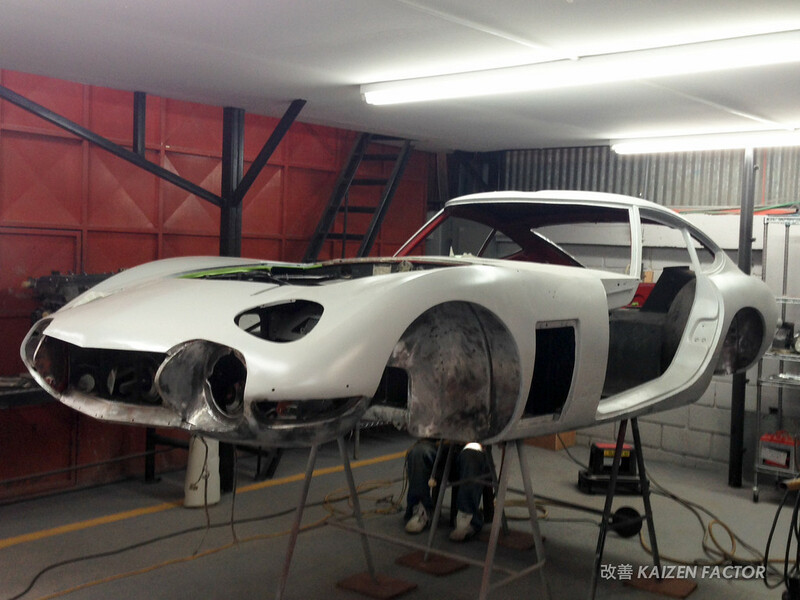 A complete gallery of the fully restored 2000GT MF10-10128 can be found HERE. 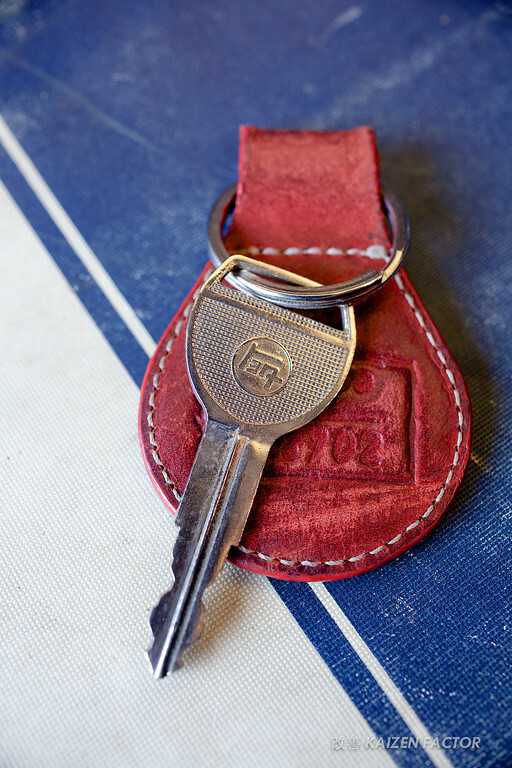 Toyota, Lexus, Scion Connoiseur Also known as Flipside909, a lifelong Toyota & Lexus owner/enthusiast, community supporter, traveler and foodie.